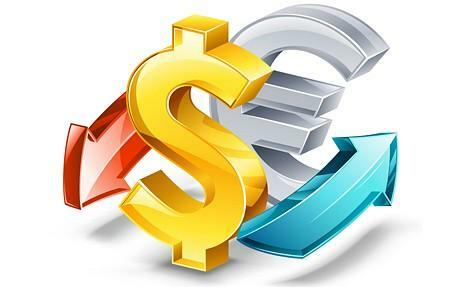 Home » Exchange Rates & Interest Rates » How Important are Interest Rates for Exchange Rates? This paper will discuss and evaluate the importance of interest rates (Highest interest rates in the world) for exchange rates and the affects and implications that take place. A literature review will be conducted in order to gather information that is relevant for this topic. The literature review content will discuss key essential fundamentals that are a necessity to be discussed for this topic. UIP, CIP and PPP have been discussed in this topic as this is a major part of the efficient market. To carry out the data and to analyse the findings regression statistics will be used through Microsoft Excel. Whilst carrying out regression other variables will be added to the regression model in order to find out the implications that would arise and the causes. The results from the findings will determine whether interest rates have an important element to exchange rates. The aim of the journal Meese et al. (1988) produced, investigates the differences between exchange and interest rates. Meese and Rogoff (1988) also looked at a few currencies when comparing and these included dollar/mark, dollar/yen and dollar/pound rates. This journal states the importance of small-scale monetary models of exchange rate and forecast predictions on how the exchange rate will change. This journal concludes that the relationship between exchange and interest rates are not statistically significant and the difference does not show an improvement over the random-walk model when the real exchange rates (Foreign Interest Rates) are forecasted. Furthermore, these results show that the monetary model performs weakly based on the negative effect it has on exchange rates, which are actually real. Another paper which was investigated by Edison et al. (1993) answers questions, mainly based on whether or not there is a systematic relationship between real exchange rates and real interest rate. In addition, by providing actual evidence to support the data, Campbell and Clarida inspects whether or not real exchange rate can be explained by shifts in real interest rate changes. In addition, the findings reveal the variances and fluctuations in the dollar’s real exchange rate. However, Meese and Rogoff look into whether real exchange rates and real interest rate changes are co-integrated. In addition, the null hypothesis cannot be rejected of the non-integrated between long-term real exchange rates and real exchange rates. The uncovered interest rate parity (UIP) is a parity condition that distinguishes the changes between two countries based on the countries’ interest rates and this is equal to the expected change in exchange rates between both countries’. If UIP does not exist then there would be an advantage for another country with a lower interest rate to obtain a profit from exchanging their currency. For example, if the interest rate in the United Kingdom is 5% and the interest rate in Australia is currently 10%. This would mean that the Australian dollar would be anticipated to decrease in currency value against the pound in the UK by nearly 5%. For investors to invest in Australia the interest rate would have to increase by 5% in order to maintain equality between both countries. UIP will also benefit countries from preventing investors from taking advantage over the exchange and interest rates. In relation, a recent article published by Eguren-Martin and Mayhew states an interesting thought that many people say when domestic interest increases the domestic currency also increases and this has been explained further. Exchange rate theory is used to analyse the importance in accounting for past exchange rate moves on relative interest rates. An interesting fact I found in this article is that relative interest rates move in the same direction as exchange rates. However, there are occasions where small exchange rate variation occurs. The Uncovered Interest Rate Parity Condition (UIP) is expressed as an equation which is shown on the left hand side of this page. This article also mentioned that if the domestic interest rate, i, is higher than the foreign interest rate, i*, then the domestic currency should be expected to depreciate in value. In addition, the exchange rate, s , is also expected to rise in order to maintain expected returns equality in a currency. Furthermore, if this relationship did not exist then there would be no point of holding money in the lower interest rate currency, when a profitable return could be made by investing money elsewhere in the high interest rate currency. Moreover, Fama (1984) and Engel (2013) stated that UIP does not always hold equality between interest and exchange rates well, the reason for this is that the results mainly focuses on the UIP equation and eliminates focusing on the risk premia components which are fundamentally important in the financial markets. Overall, UIP parity condition is not useful for forecasting exchange rates. However, the UIP is still helpful tool for decomposing past movements and analysing the various elements that are involved. From analysing this paper it has shown that small exchange rate variations occur which are caused by the risk of premia. This paper on covered interest rate parity (CIP) written by Raja, MH et al. (2014) similarly follows the same aim as UIP, which is to prevent obtaining a profit through borrowing money in one currency, using this to convert money that is available in the spot market where cash can be generated quickly or selling funds in the open market. In addition, CIP plays a major part in the market and is vital that there is a good form of efficiency. Raja, MH et al. (2014) indicated that the foreign exchange market has a huge impact on the monetary policy which is the process where the monetary authority of a country controls the supply of money. Furthermore, the foreign exchange market also changes the fiscal policy which is used by governments to maintain their spending level for the country and the tax rates in order to develop a better economy. There are many studies that support and argue against CIP in this paper. Moreover, an intriguing point has been mentioned by Crowder (1995) that had evaluated the profitable deviation actually happened to be longer than what is expected from an efficient market and does actually happen in UK, Germany, Japan and Canada. The continuation of deviations can be more than a few days, therefore daily rates are taken place and this can be said that the market is ‘weak form efficiency’. Chortareas et al (2009) stated in a paper that for testing the validity focus on the time scale of real exchange rates in panel frameworks. This paper focuses on PPP hypothesis and the real exchange rates in 25 OECD countries. In addition, the findings conclude that the evidence of mean-reversion is considerably stronger and enhances the PPP to be the same. Another journal by Juselius (1992) on PPP investigates new tests for structural hypotheses which look at involving two or more variables for error correction model with Gaussian errors. These tests are then analysed and then motivated using empirical investigation of the PPP relation and the UIP which is for the UK. This paper also looks at co-integration between PPP and UIP and concludes whether or not the test that has been conducted has proved a null hypothesis. This section is based on the method that will be used to determine the relationship between interest rates and exchange rates for the currency chosen. Regression statistics method will be used to analyse the data and other variables will be added in order to find out whether or not this has an effect on the relationship between interest and exchange rates. The main aim of this method is to test out the importance of interest rates for exchange rates. The interest rate that will be investigated for the regression model is UK interest rate and this will be the independent variable and the exchange rate that will be used for the regression model is GBP/USD exchange rate. The exchange rate from GBP/USD and the UK interest rates for the years from March 1996 till March 2016 will be used for this regression model. The data collected will be the monthly values over twenty years and also represents wide range of changes that had taken place over the years; this includes the interest and exchange rates. 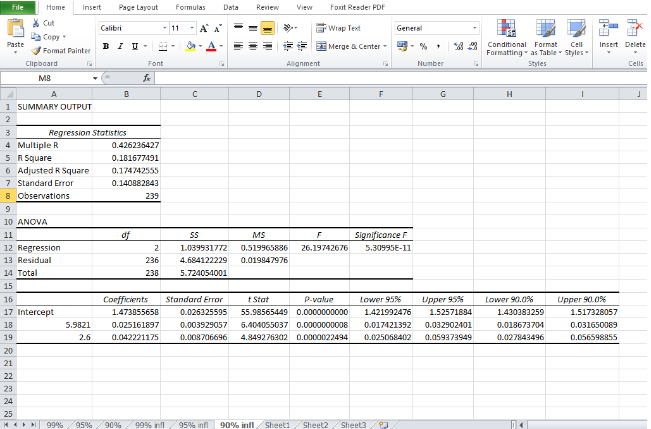 To test the importance, this regression model y=a+b1x will be used to evaluate this. This model includes two variables which includes the y and the x. The y in this model is the dependent variable and x is the independent variable. The y in this case is the exchange rate and depends on the independent variable x which is the interest rate. The y represents the GBP/USD exchange rate and the x represents the interest rate for the United Kingdom. 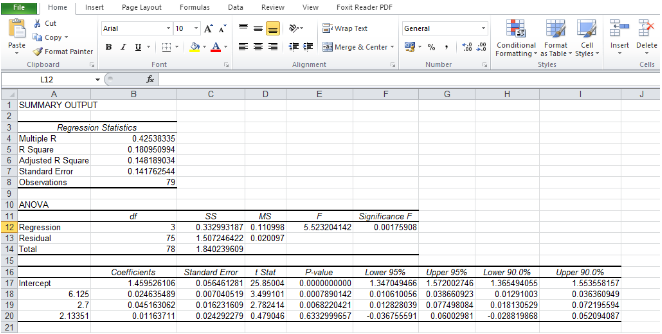 To carry out the regression model Microsoft Excel will be used and this will enable the co-efficient, intercept, probability value and other variables that are involved to be calculated. To further investigate this relationship between interest and exchange rates another variable which is inflation will be added to see whether this does have an effect on the model and whether or not it does impact the relation between interest rates on exchange rates. The US inflation rate is added as a variable to the regression model to identify the impact it has towards interests and exchange rates and will able to determine a conclusion based on the model’s outcome. 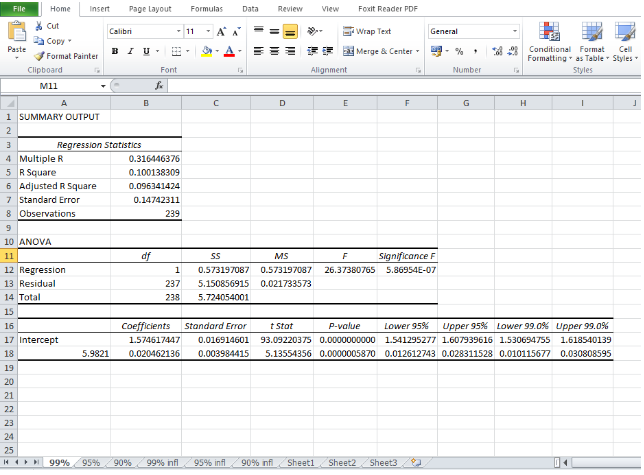 The formula that will be used is y=a+b1x+b2x where b2x will be the inflation. This will help evaluate whether inflation does impact the link between interest and exchange rates. Furthermore, Gross Domestic Product (GDP) will be added as another variable and the formula will be y=a+b1x+b2x+b3x where b3x will be the GDP. To run the regression model GDP quartile data need to be gathered and for all the other variables starting from March 1996 till December 2016 in order to produce the statistics. The data gathered will cover twenty years and nine months and this would enable a better range and enable to evaluate a clear conclusion from the findings.Gives you the p-value for the hypothesis test. This section will state how the information was gathered and develop an understanding about exchange and interest rates and about different variables that can be added in order to conduct the regression statistics and determine a conclusion for this paper. The exchange rate is the value of one currency when it has been converted by another currency. The exchange rate can be either fluctuated or fixed. In addition, the exchange rate can be considered as the spot rate which is the current rate that is changed for interest rate differentials. The interest rate is the value that is expressed as a percentage for borrowing usage of money or assets. 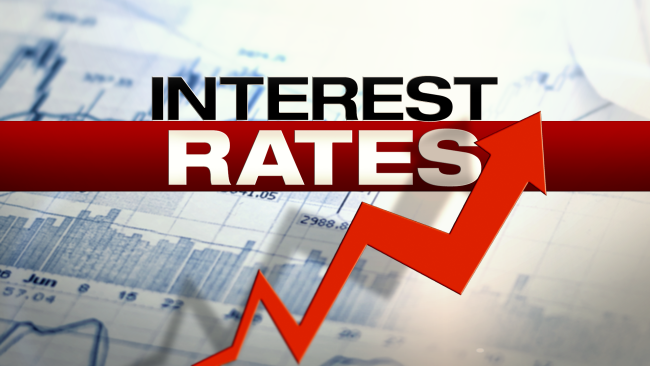 Interest rates do vary due to inflation results and the Federal Reserve Board Policies. When consumers use interest rates to gain income it is expressed as an annual percentage yield (APY) this is through a savings account or any other form of investment accounts. The interest rate that will be investigated for the regression model is UK interest rate and this will be the independent variable and the exchange rate that will be used for the regression model is GBP/USD exchange rate. Moreover, a variable is a characteristic that can be measured and can also be used in formulas. Variables in every experiment can either be independent, dependent or controlled. A dependent variable will measure the element that the experimenter believes will be affected whilst carrying out the experiment. An independent variable will measure the changes whilst the experiment is taking place and this is the element that the experimenter believes will impact the dependent variable. Controlled variables are remained constant and the experimenter evaluates the impact on the independent variable and other elements. The variables that will be for the regression statistics will be inflation and the gross domestic product (GDP). This will help determine whether other variables added to the regression model benefit the model and allow the model to work. The inflation rate is when the general level of prices for goods and services rise whilst the purchasing power decreases in value of currency. The Central banks try and prevent deflation and attempt to maintain the inflation level at a reasonable level to enable the economy to run efficiently and effectively. The inflation rate is when the general level of prices for goods and services rise whilst the purchasing power decreases in value of currency. The Central banks try and prevent deflation and attempt to maintain the inflation level at a reasonable level to enable the economy to run efficiently and effectively. In addition, due to inflation the purchasing power of a unit of currency decreases in value. For example, if the inflation rate is 5% for a pack of cards that costs £1, the inflation will result the pack of cards to cost £1.05 the next year. The Gross Domestic Product represents the country’s economy of all goods and services that have been produced over a period of time. The GDP value is represented quarterly every year. If the GDP rises in value by 5% this means that economy has developed by 5% when compared with the previous year. In addition, GDP does impact the economy through increasing or decreasing the stock market values. The more efficient and effective the economy is the better the unemployment rate, wage increase and demand for labour for businesses. This results the economy to grow well and avoid recession. 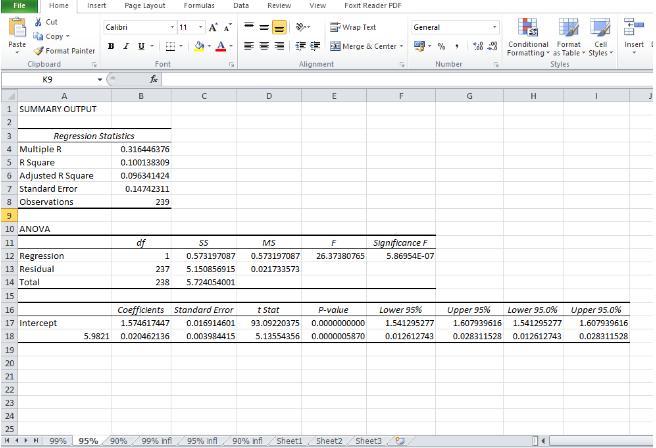 The GDP will be added as a variable to the model to see if this does impact the regression statistics. The data for the interest and exchange rates for GDP/USD currency was collected from the consumer price index (CPI) website and the daily exchange rate source was gathered from the Bank of England website. The consumer price index measures the average daily variance in the price of goods are services that are paid by consumers. In addition, the data for inflation was gathered online from Office of National Statistics. Moreover, the data for the Gross Domestic Product (GDP) was gathered from Economic research website. The findings from the regression statistics show a wide range of data for confidence levels and shows how well the model actually is. 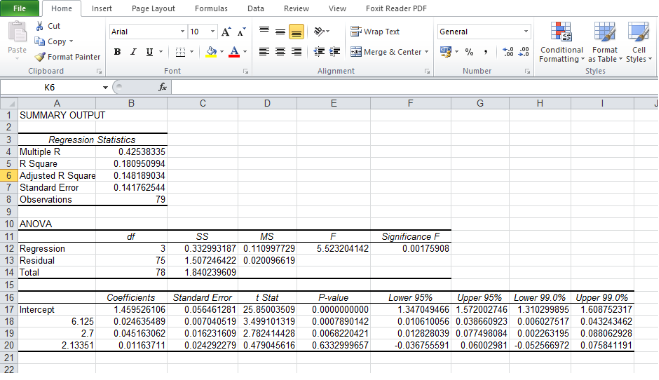 The R squared is the coefficient of determination and it shows how many points actually lies on the regression line. The R squared value also indicates the correlation of the regression model. 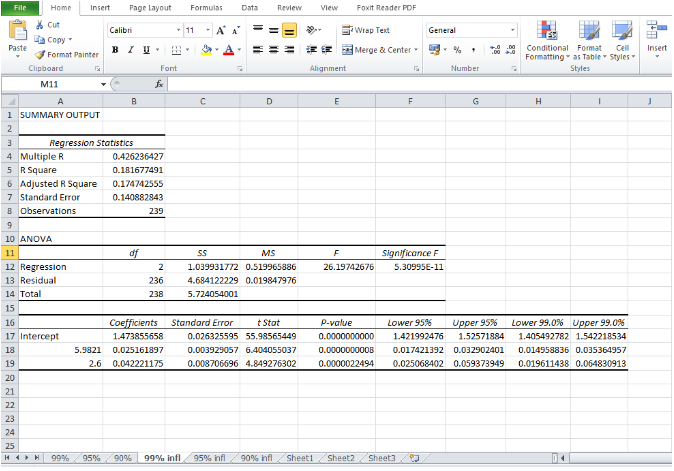 In addition, R squared shows how good the model actually is and whether or not this model will work. 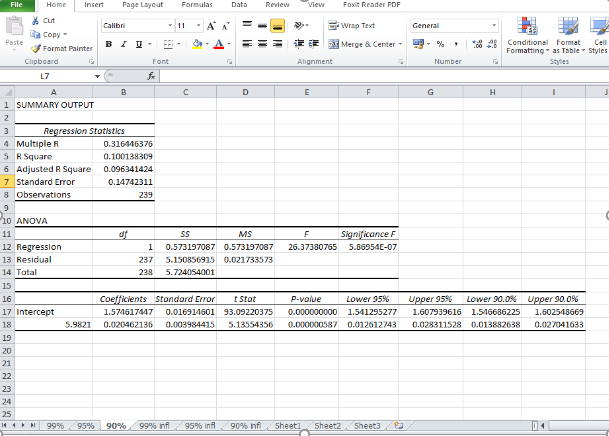 The findings for confidence level 90% illustrate the regression statistics to show a value of 10% for the R squared. This percentage can be explained how much the dependent variable, y is affected by the independent variable x. From evaluating the statistics for the confidence level 90%, the illustration shows that 10% of the value actually fit the model. However, there are 90% errors due to unmentioned variables and this may have an effect on the model and cause the r square value to become low. In addition, the intercept for the co-efficient for 90% confidence level shows the value to be 1.57 and the x co-efficient as 0.02. The probability value is less than the 0.01 therefore, this shows that this regression model will work and shows that there is a relationship between exchange rates and interest rates. The results for 90% and 95% confidence level have minor differences when compared with the regression model results for 99% confidence level and the model still works for these two confidence level. Therefore, these results show that the alternative hypothesis is valid and this model can be used. 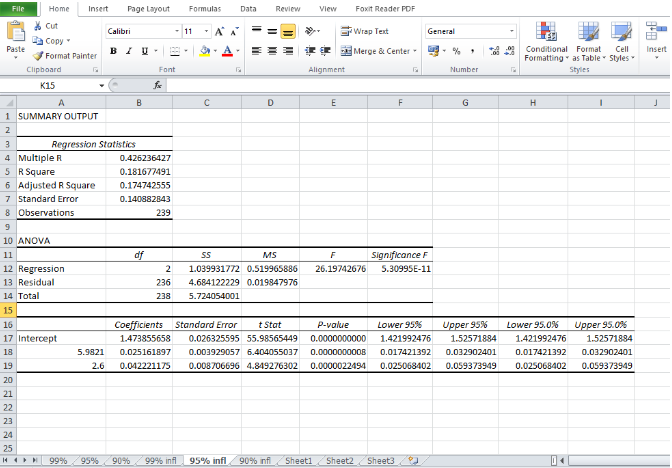 Overall, from evaluating the regression models this has led to conclude that.